I often fish with newbies—friends and relatives who range from only lightly experienced fly fishers to the completely uninitiated. So, I frequently wind up as an instructor. 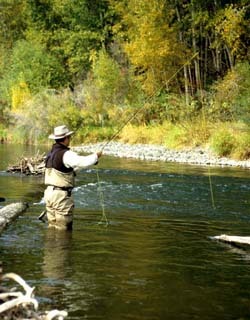 It's a natural role for a writer of fly-fishing and fly-tying how-to books and I enjoy it. Over the years I've noticed that high on the list of areas where rising fly fishers have trouble is the whole business of fishing nymphs in rivers. With nymphing, if you miss a few key points, you're practically out of the game. But my approach to teaching someone how to fish a nymph has evolved to where now, in fairly short order, I can sometimes take a failing beginner to steadily catching trout with these ten ways to improve your nymph fishing. Never Take Your Eyes Off the Indicator. How can trout possibly know when the nymph fisher glances away? They can't—that's the rational answer. But, somehow, they do—and when the angler's eyes roam is precisely when they take a nymph. I've watched a new fly fisher miss strike after strike, distracted by a bird or passing car or even the casting of another angler. from the time it touches the water right up until you pick it up. in fact a trout may. the trout is already spitting out the nymph. The standard line is correct. Therefore, the strike has to come as soon as possible after the indicator tells—nearly immediately. This takes a little doing. When I first tie on a nymph after winter calms down, I usually miss the first few fish as I clear the cobwebs out of my reaction time. After that, I'm in good shape for the rest of the season. You can imagine how tricky this can be for the beginner. Listen, it doesn't take superhuman speed to hook a trout on a nymph. Move slowly and you'll still catch some fish. A few will hook themselves solidly on their own. So don't get spooked away from nymph fishing because you fear your reflexes aren't up to the job. But remember that a swift strike to a twitching or diving indicator will kick the action way up. When you strike immediately, do so lightly. your tense body will react slowly, which will drag down your reaction time. The hard strike is all disadvantage. The light (quick) strike is all advantage. Get the Fly Down to the Trout. If your fly isn't bumping the riverbed now and then, and especially if you're not losing an occasional nymph to a rock, then you're not doing it right. Of course, this rule doesn't apply to methods that hold the nymph up away from the bottom of the river, such as the lightweight shallow nymph suspended from a dry fly during a hatch, and the hopper-dropper approach. There are lots of things you can do to help a nymph sink deep. The main thing is to set the strike indicator up high enough on the leader (about twice the depth, except in the slow currents). But a heavily weighted fly helps, and in really fast or deep water some weight up the leader—lead or lead-substitute split shot, putty, twist-ons...—can turn slow fishing suddenly to fast fishing. Those narrow line loops that snap the water from a dry fly and push it way out there when a long cast is required are normally murder in nymph fishing. With a strike indicator, perhaps added weight on the leader, and a weighted fly (sometimes two or even three weighted flies), the narrow loop invites tangles. Much better to cast lazily, smoothly, with a wide loop to keep the bouncing rig away from the line. Of course if you're fishing the nymph close, avoid all this by just swinging the rig out there rather than really casting at all. You can't get into much trouble if the line and leader loop unhurriedly around behind you and then back out onto the water the same way. Or if you just let the line straighten downstream and then chuck it back up and out in a single stroke. You'll spend your strike time picking up line—and not setting the hook until it's too late—if your line lies in too many waves and coils. Some slack is good; it helps keep the indicator drifting freely. So expect and throw slack-creating casts, like the lazy-S cast, and to mend line. But a little slack in your fly line is plenty. If you can pull all the slack out in a modest raise of the rod-tip, you've got all the slack you want. No one can really tell the tick of a stone from the light take of a trout. If you strike and nothing's there, no problem; just let the fly continue its drift. you'll simply miss setting the hook on a lot of trout. And everything the indicator does other than drift calmly is a reason to strike. Strike indicators do go down suddenly and hard—happens all the time. But often the take of a trout is subtle, the indicator giving only a little pause or twitch. Doesn't matter, violent or subtle—set the hook. 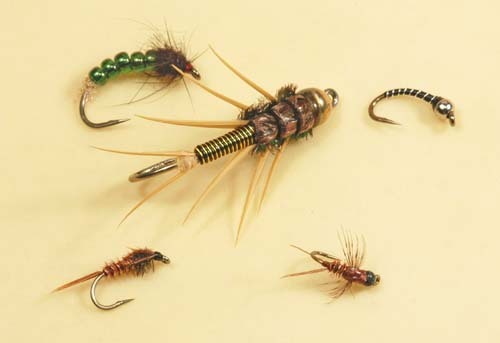 That Prince Nymph that killed yesterday may be useless today, because it's just an hour before the BWO mayfly hatch and the trout are busy down there scarfing up little dark nymphs; today, you'll probably do much better with a Troth Pheasant Tail or Anatomical Baetis/PMD. Everyone expects to change dry-fly patterns, but not so many seem to understand that trout can be just as picky about nymphs. It's difficult to tell what's going on down there. 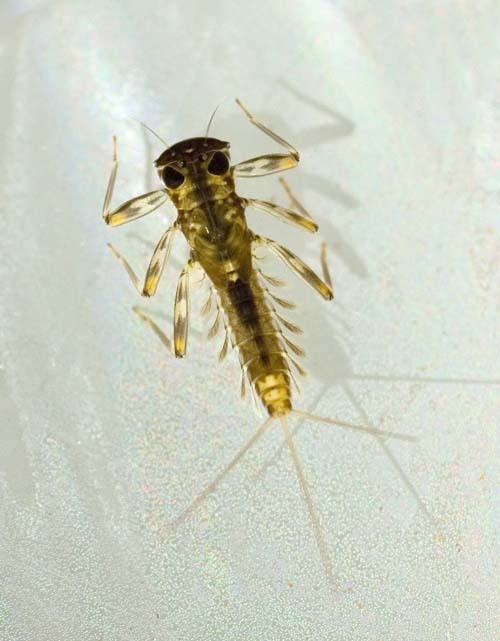 Are golden stonefly nymphs creeping to shore and getting swept to the trout by rogue currents? But it's not always about imitation. If an attractor nymph seems appropriate—as when there's no evidence of a hatch and imitative nymphs are doing little—try a Copper John, Silver; then a Gabriel's Trumpet, Gold; then a Yuk Bug and you'll probably find that one will out produce the others, perhaps by a landslide. 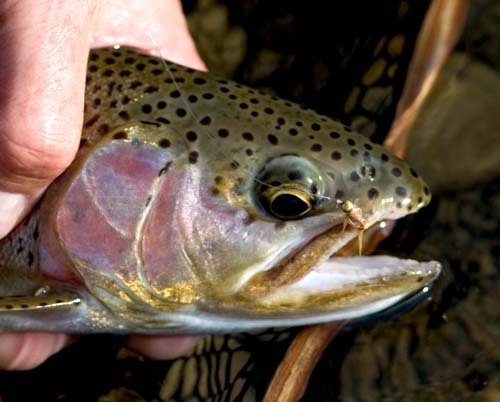 Though none of these flies really imitates anything, the trout will typically prefer one or the other, and their preference will likely change from season to season, day to day, even hour to hour. It's just a fact. If you figure out why, please tell the rest of us. Try All Water With Any Promise. Run your nymph through every riffle or run or pocket that seems even slightly plausible, at least until you figure out where the trout seem to be holding right now. If you do stick to only the most promising spots, you may find that the trout didn't. Case in point: I was fishing a Colorado creek last month and none of us found a thing in the long, deep near-perfect runs. 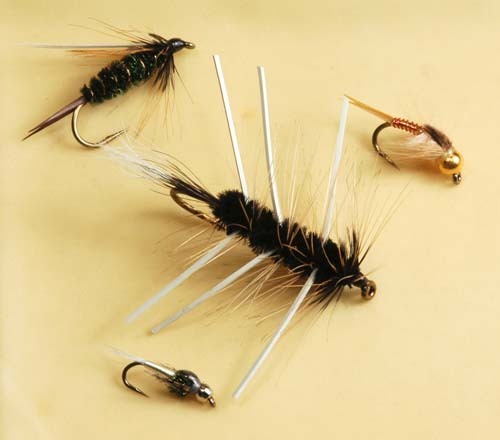 But I hooked half a dozen browns in fairly short order by passing my nymph through quick little current lines between even quicker ones in the rapids. Such events are common. Here again, tell us when you figure out the reason. And don't overlook shallow water, the water beginners often tromp right into before they start fishing, because it can also offer promise—trout, including some big ones, really will hold in a foot of streamy current. So run a nymph through plausible shallow water a few times before you consider stepping into it. Czech nymphing, with the downstream draw of the rod, close in, and a heavy nymph holding down another lighter nymph or two, is all the rage. And it may be just the thing for those side channels off a big river or the riffles of your favorite creek. But if you need to punch a nymph out fifty feet, Czech nymphing is useless, and long-range nymphing is just right. So be prepared to apply either technique, or both, in a day's nymph fishing. Same goes for the hopper-dropper and the swimming nymph on a sinking line and the rest—be open to changing techniques and know how to make each of them work. All nymph-fishing techniques have their appropriate times and places. Although it's common to find that two or even three techniques may work equally well in a given situation. As when my friend Doug fished in standard indicator style while I fished the Czech nymph technique on a small local river last summer and had about equal, and very good, action. These are the principles I teach to nymph-fishing newcomers, and they are principles I came to the hard way—by catching, and failing to catch, a lot of trout over hundreds of fishing days. certainly find your fishing mostly good to occasionally red hot.